Having read part 1 of this review, you’ll know that as a teenager, I was a little bit of a Sony fan girl. Although, with the introduction of Apple’s iPod I was swayed. It wasn’t until recently, whilst writing for my blog, that I really got back in touch with what Sony have been doing, and I have to say, their new products are impressive. I was quite concerned at the quality of Sony products at one point, two of my more recent products broke within a year and so, I was put off. This was a good, six or seven years ago now, but they certainly seem to be coming back to form! I was incredibly impressed with the W-series and so, it was time to compare the B-series. I was sent the B152, an attractive, small and pocket size MP3 player. The B-series are available in 2 or 4gb memory capacities, just like the W- series. Charging is by USB and in true Sony style, doesn’t take very long. The device is incredibly light and so small, you can pretty much take it anywhere at any time too. Even wearing that little black number. 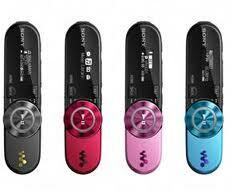 The only area this great little MP3 player loses points, is that there’s no clip. Hopefully in newer versions of this product, Sony will take note and rectify this. Overall, this great little rival to Apple’s shuffle gets an easy 9/10 for me, and there’s no need for ITunes – Hoorah!!! Had it come with a clip it would have got full marks. It comes in four different colours, black, pink, red and blue. Great work Sony, now for an iPod killer maybe? Previous Previous post: Keen on Photography? – Check out Photokina.